If you haven’t taken to the air and experienced the many benefits of aerial applications when it comes to managing commercial or private crops, it is time to discover the abundance of pluses. Unlike ground spraying, aerial application services do not cause damage to crops, disrupt soil and can be done even when plants and crops are wet. Crop dusting is certainly not a new concept. Many farmers and growers have utilized Aerial application in Wisconsin by airplane for decades. However, helicopters are fast becoming the transportation mode of choice. Unlike an airplane’s fixed spraying, helicopters are faster, deliver a more precise spray and can more easily maneuver around obstacles like trees and telephone lines. FairLifts provides growers with access to the vast and growing network of helicopter spraying options in Wisconsin. Wisconsin is well known for its dairy production, which is probably why residents of the Badger State consume almost 21 million gallons of ice cream. Green Bay may be considered the “Toilet Paper Capital of the World,” but it is Twin Rivers who first thought of putting together an ice cream sundae way back in 1881. Of course, milk and its dairy bi-products are a huge part of Wisconsin’s economy, but the state is a top supplier of cranberries, whey, ginseng root and sweet corn as well. Grain is another major crop since it is a prime component of the feed given to livestock. Known for its harsh winters, Wisconsin’s growing and harvest seasons are of paramount importance to the state, making it ripe for the supreme benefits of aerial application services. Making the decision to manage your crops from the air is a cost-effective and productive one. Aerial application options are quickly becoming the method of choice throughout Wisconsin. Through FaifLifts, growers gain immediate access to a large network of the best helicopter pilots available as well as a menu of aerial services. Crop dusting is a broad term in the agriculture industry that applies to an array of aerial applications including seed spraying, watering and the application of fungicides, herbicides and fertilizers. Each facet works together to help crops grow and flourish from planting to harvest. All of these crop dusting options are available through aerial application services in Wisconsin. Beetles, aphids, grasshoppers, caterpillars and other insects make life miserable for farmers and growers throughout Wisconsin. 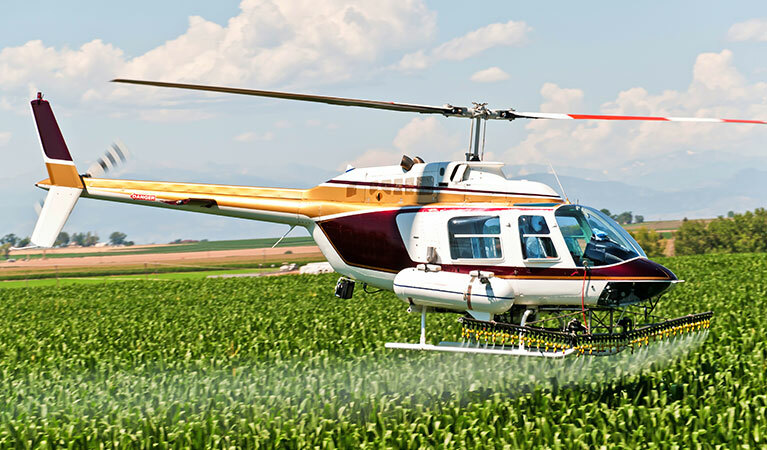 A pest infestation can ruin an entire crop, which is why proactive pest control by helicopter spraying is essential. Life along the Great Lakes can be beautiful especially in the summer, but mosquitos can turn an outdoor event sour. Aerial application options include regular mosquito sprayings to keep the annoying, disease-carrying pests in check. Weeds are anything but harmless when your livelihood depends upon flourishing crops, plants and flowers. When left unchecked, weeds and brush deprive vital crops and plants from water, sunlight and nutrients. Weeds typically grow at a much faster rate than plants making proactive herbicides a vital component of crop care and maintenance. Aerial herbicide applications are much more effective than traditional ground spraying, covering more ground. When you need helicopter spraying services in the Badger State, don’t look any further than FairLifts. Our professional, knowledgeable staff is available to help you discover the optimal aerial options for your commercial or private farm. Contact us by telephone or using our convenient online form. We are available 24/7. When you need helicopter spraying services in the Badger State, don’t look any further than FairLifts. Our professional, knowledgeable staff is available to help you discover the optimal aerial application options for your commercial or private farm. Contact us by telephone or using our convenient online form. We are available 24/7.